Railpictures.ca - Steve Bradley Photo: With spring finally in the air, the northbound Orangeville Wayfreight passes MP 21 on a rare Wednesday run. CP’s Streetsville Switcher was very late on Tuesday, so in true shortline fashion, Cando ran an extra to service the customers. After 17 years, the Cando era will soon come to a close on this line. Effective July 1, Trillium Rail will take over operation of the 35 mile line. | Railpictures.ca – Canadian Railway Photography – photographie ferroviaire Canadienne. 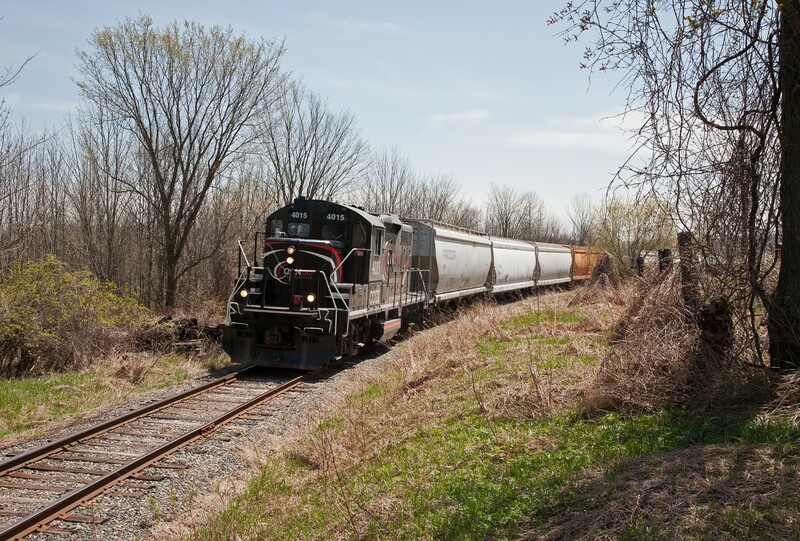 Caption: With spring finally in the air, the northbound Orangeville Wayfreight passes MP 21 on a rare Wednesday run. CP's Streetsville Switcher was very late on Tuesday, so in true shortline fashion, Cando ran an extra to service the customers. After 17 years, the Cando era will soon come to a close on this line. Effective July 1, Trillium Rail will take over operation of the 35 mile line. It’s a wonder how long Cando will hang onto the BCRY. Or how long they will last at all…maybe less ground to cover…track work expenses, etc but i’m seeing car loads less than they did in the the Orangeville Streetsville run…maybe Barrie pays more and the line stops at Utopia interchange…just a thought. The clock is ticking quickly Brad. Here is the current plan, but understand, things can change. Thursday June 21 serving Orangeville only. Train will NOT go south. Friday June 22, not operating. Tuesday June 26, normal trip. On duty 0700. Friday June 29, southbound only. Terminate at Streetsville. Sorry, it’s probably been mentioned, but what days and roughly what times does Cando operate? I’m going to be in Streetsville and want to catch one of the last runs. Thanks! I’m a wee bit concerned though with Trillium as they split from the ex CN Cayuga spur… Bridge maintenance I believe..but maybe i’m talking out of turn in logistics and so forth. I was hoping G&W or Ontario Southland would be on the ball…. and the latter seeing some F units comes into Streetsville! But a Trillium RS18u will be just a fun! Hope it goes well. The Burford Spur is pretty hit and miss, but perhaps you’ll get lucky in the summer! The over under shot is not the easiest to get, but it does happen on occasion! As for age, yes, I’m 22 now. Just finished university and am looking to get into teaching now! Thanks Joseph! I seen your profile many times and your images are great! You seem to be one of the few on here to have captured the over/under photo of CN 580 and SOR on the Burford! Man that’s a great shot!! I still have yet to check out the Burford and with CN taking over SOR it seems I better do it sooner rather than later if you know what I mean. I tried posted on here when I was 14 but they weren’t good enough. I finally started practicing with a good digital camera when I was 15 and now a few images made it on here but it appears I still got lots to learn. Thanks for the complement too, I sure hope your right! I’m assuming your in your early 20s now being that you began posting on here around 2011? Steve, that’s interesting! As stated earlier I sure hope Trillium brings back the Explorer!! Good for you Graydon, I started posting on here when I was 14, you’re learning lots and will do well in the future! As you can see it’s not spectacularly huge but it’ll do. I really hope to finally fix the power on the first section with all the mountains. Power over there is a complete nightmare!!!! Railfan 99…sorry what is your name? I can imagine meeting you and calling yo Railfann 99 . And Stephen too..I’m 46…I got back into the hobby, omg 10 Years ago now in a 20 Year absence as music and other things pre-occupied me. But I haven’t grown up, many musicians haven’t ha…And i’ve met some pretty ‘old’ model railroaders in my time… Visit the Toronto club…unfortunately in Scarborough now (used to be in Liberty Village…and as soon as I moved into the area they had to pull out due to gentrification)…anyhoo…this isn’t an MR site so i’ll get back to the Trillium issue at hand…we’ll just have to wait and see. But feel free to message me up at Model Railroad Hobbyist for more MR discussion. And Steve was nice enough to give my friend Peter a lift as they know each other as Peter works at Credit Valley (the shop)..
Graydon you have to wait – no one knows what Trillium’s going to do yet. So asking these questions is premature I just know at 15 year olds patience wears very very thin. I have much more now that I’m in my 40s. You won’t grow out of the hobby – most keep it lifelong in some capacity, but we’ll see People come and go young man, but a good number stick around, and most for the long term. Ok I’ll wait. Reason why I mentioned above that I understand it could be to early too know is because I had a feeling you were going to mention patience to me. So I’ll wait and see like the rest of everyone on here. You really think I’ll grow out of the hobby at some point? Brad, your layout seems pretty cool! You love the switchers eh? I have quite a few of the GEXR geeps actually in my fleet but also really enjoy collecting more Canadian and US railroads. Graydon patience young grasshopper. Also, you haven’t grown out of the hobby? You haven’t grown up yet buddy You are so young it’s not even funny. Patience, wait two months OK? @railfan99 sorry mate…look me up as OSCR. Railfan99 I too am a model railroader. I have a blog @ http://model-railroad-hobbyist.com/magazine... look me up. cheers! Thank you again for the ride Steve! I’ll never forget it! Yes I have to agree with tight regulations being a shame to limiting opportunities. One of my best childhood memories is your Train and I almost always would catch you at the diamond! Unfortunately tho with school and my parents work schedules I could only come out to see it a few times in the summer. Didn’t get to see your Train at all in 2013. Finally when I was 14 parents let me take the bus downtown on my own (I’m the older sibling which should easily explain that, you may remember my younger sister waving to you as well at the diamond back in 2010, 2011) and by then I got to go out on PA days, during exam break, spring break etc asn that is also when I explored the line downtown a bit more. I used my phone to shoot you for quite a while up until late 2016 when I got good with a good quality camera. Last summer I shot you multiple times and I was pretty much always in a different location for every photo but still downtown. I also played on my high school curling team all 4 years I was there (I’m graduating this June) and I have fond memories of listening to you rumble by the Brampton Curling Club (located a block away from the McMurchy Ave crossing) while I was on the ice! Anyway I’ll keep my fingers crossed to passenger service coming back eventually as well as hopefully doing the occasional run past Slengrove. Do you know by any chance Triliums schedule for operating the line? Will it remain the same or could there potentially be a change? I understand it could be too early to know as well. Also, I’m not sure if this will interest you either but I have a model of 4009 in n scale that was custom painted for my 15th Birthday. Have you ever had any interest in Model railroading? That hobby never grows old for me! Checked my book and indeed it was me Railfan99. Was always nice to get young railfans into the cab for a while. That’s what got me going in railroading quite a few years back. It’s a shame that liability and tight regulations are spoiling that opportunity. Not sure if Trillium will revive the excursion service, but we can only hope. Brad, I actually met the engineer ‘Steve Bradley’ once when I was 12 and he was nice enough to give me a cab ride in 4009 down to the Vasley Plant and back. Remember the day very well it was Tues August 28 2012 and that day the OBRY only ran as far as Vasley as Steve told me the day before they did a very rare Monday run to Streetsville and back. Steve do you remember that? My dad was with me too that day and he was pretty interested about what was loaded in the tank cars? I had a nice conversation with Steve and I too requested that he run the Explorer at least into downtown Brampton as I absolutely LOVED seeing them cross the diamond but he told me the only issue was they didn’t have a runaround track past Slengrove. They had 2 locos for a short period before 1000 was sent away so that’s how they were able to successfully do the rare extra-milage run in 2008. I just had a thought that maybe if Trillium purchased a caboose for the rear end (like Waterloo Central) than that should help them succeed with taking the train past Slengrove here and there. Yes I do remember CANDO using a caboose with their Explorer but maybe they just choose not to try and go for extra-mileage. I personally just think it’ll be nice to give the fans of the Explorer a change to go even further up the line every now and then. Doubt they’ll have issues with not enough tickets being sold lol. So the lines going to survive?! That’s great!! Let’s hope the Credit Valley Explorer will come back too. And if they do let’s hope that in the new era they do the rare extra-mileage run to Streetsville more than just once! Trillium? That’s great…hopefully we’ll be seeing an old Alco work the line! Wow interesting news and glad to see things move forward.